LG Electronics is bringing features from its more expensive smartphones into the hotly contested low-end segment of the market. On Thursday, the company announced the L Bello and L Fino, two 3G Android-based smartphones that echo some aspects of the design of LG’s G3 flagship model. They have buttons on the back just like the G3, and the L Bello’s plastic back is reminiscent of the texture used on the G3. The material is different but it has the same “metallic skin design” for a similar look and feel, an LG spokeswoman said via email. Both models look more sophisticated than their predecessors. The smartphones have also inherited the G3’s QuickCircle cases, which give access to frequently used functions such as calling, text messaging, music and camera all from the window without opening the cover. The improvements LG has made is another sign that smartphone manufacturers are taking the low-end of the market more seriously. Increased competition has forced them to develop better products in an effort to stand out, if they are to take advantage of the growth currently seen in this segment of the market. The L Bello is powered by a 1.3GHz quad-core processor. The screen measures 5 inches and has 854 by 480 pixel resolution. The smartphone also has an 8-megapixel camera on the back and a 1-megapixel camera on the front. There is 8GB of integrated storage and 1GB of RAM. The L Fino is powered by a 1.2GHz quad-core processor. The screen measures 4.5 inches and has 800 by 480 pixel resolution. It too has an 8-megapixel main camera, but users will have to manage without the autofocus available on the Bello. The front camera takes pictures at 640x480 resolution. The Fino also has 1GB of RAM, but the integrated storage has been cut from 8GB to 4GB. Both phones use Android 4.4.2 and can access the Internet at up to 21Mbps using HSDPA. Another key feature on the software side is Knock Code, which lets users unlock their smartphone by tapping a personalized pattern on the phone’s display. Users can also take pictures by tapping anywhere on the screen to focus and shoot or open and close a hand in front of the lens to start a three-second countdown before triggering the shutter, LG said. 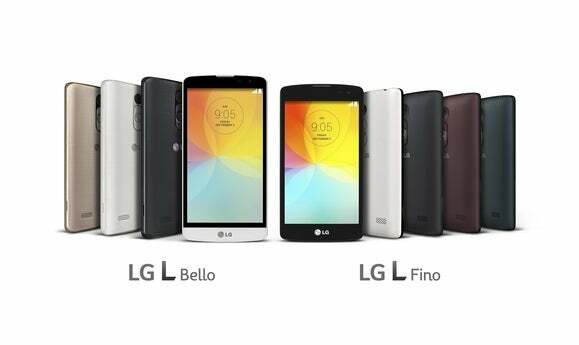 Starting this month, LG will begin rolling out the L Fino and L Bello in some parts of Latin America, with countries in Europe and Asia to follow. They are expected to cost less than US$200 without a contract, but LG hasn’t made any final pricing decisions yet, it said. The smartphones will be on display at next month’s IFA trade show in Berlin. At IFA, the company is also expected to launch a new smartwatch and even more smartphones.